My painting has been put on hold for the holiday period, as my studio is also my eldest sons bedroom when he is home. It has been a good opportunity to review work and ideas and have a sort out of dried up paint tubes and throw out worn brushes. The toughest job was scrubbing off the paint spots on the floor…… in fact many are still there. It has given me a chance to do other creative things. I am a great fan of Kirstie Allsopp and her Christmas craft programmes, so much so that I had a go myself. Wishing everyone a very merry Christmas. Different cultures and countries all celebrate in different ways, but in the spirit of Christmas, we all hope for peace and joy. so I hope that this is true for you too. There are no photographs to accompany this post. Sorry! – but for me there is a reason. 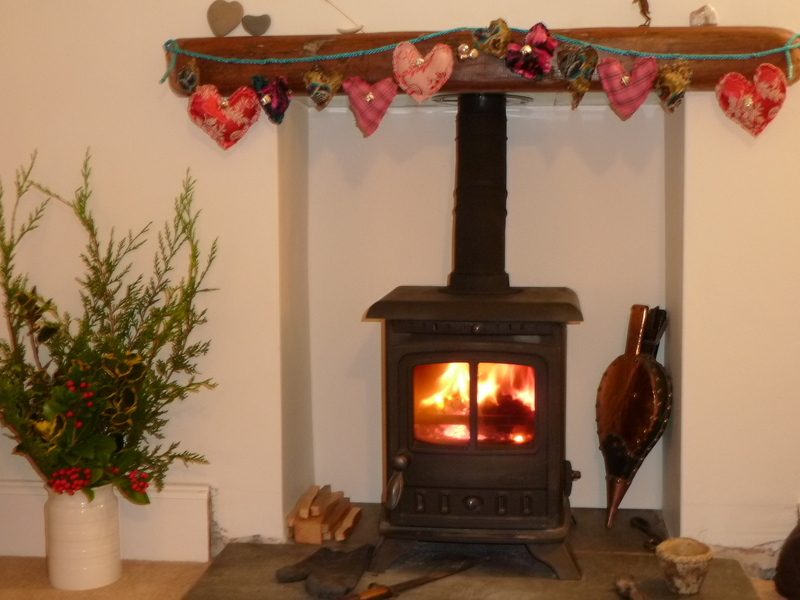 The next time you are travelling along a cornish lane or indeed any country lane in winter, look for the colour and the change of colour in different lights. You will see blues, browns, burgundys and greens in all shades. I tried taking photographs. It may be the shortcomings of my camera or my lack of knowledge when using it, but all the colours I can see are lost in the image. So the only image I can work from is the one in my head. As an artist, I am able to distinguish the different blues or siennas, and know which colours to mix to get a specific colour, so I now travel with a pad and pen in the glovebox of my van so that I can instantly make notes for future reference. The gorse in the Cornish hedge comes and goes all year round, due to the mildness of our climate here. The sulphurous yellow is so vibrant and saturated. It is pure lemon yellow with hints of cadmium yellow to give it depth. Where the light catches the hedges, it reflects and bounces light around, off the tangle of branches, twigs and brambles in a dazzling array of siennas and grey blues. Whilst the outer edges and tops are mostly yellow ochres and raw siennas, the darker inner hedge is a mix of burnt sienna, burnt and raw umber and the whole spectrum of blues to give an endless variety of what the most people would term “brown”. But these browns have a richness unsurpassed by any generic brown. This way of looking at the colour also applies to the greens. I never use the already mixed “leaf green” or “phalto green” which are very bright and harsh. I prefer to mix my own which have a natural softness where you can add light or dull it down, where it reflects or absorbs light. This gives a painting harmony and is probably why a landscape painting holds the eye as the brain and eye are revelling in the optical melee of wonderful colour. Sandymouth as the name suggests is very sandy!! 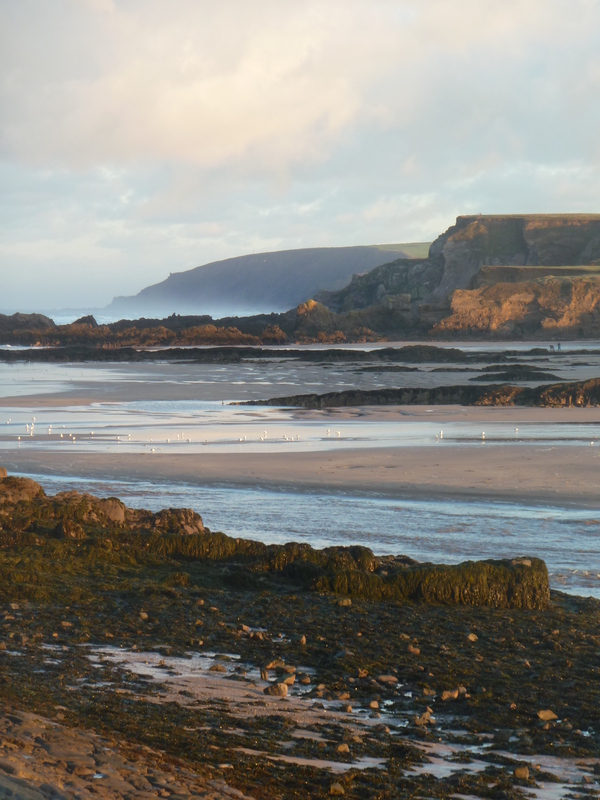 On a low tide, the beach is expansive, stretching from Warren Gutter all the way down to Bude and beyond. I was on a mission to collect mussels for supper. I managed to time my walk to the far end of the beach perfectly as the low end of the tide receded past Mussel Rock allowing me to take the best of the mussels. I had to keep one eye on the surf though, as there was quite a wind behind it which every so often sent great surges of water up the beach and around my legs. More than once I could see the waves doubling up which sent me running up the beach to avoid being totally swamped. 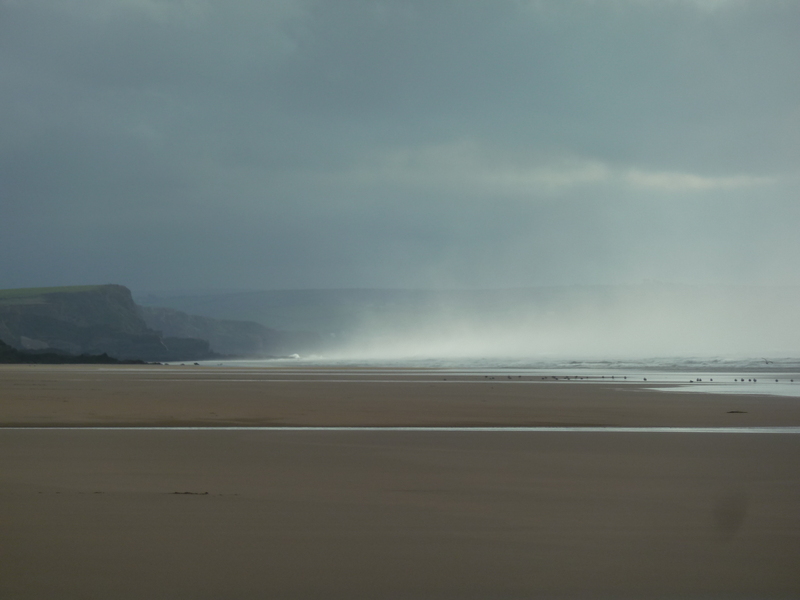 There was also an overwhelming feeling of vulnerability as I was totally alone; not one other person on the beach. 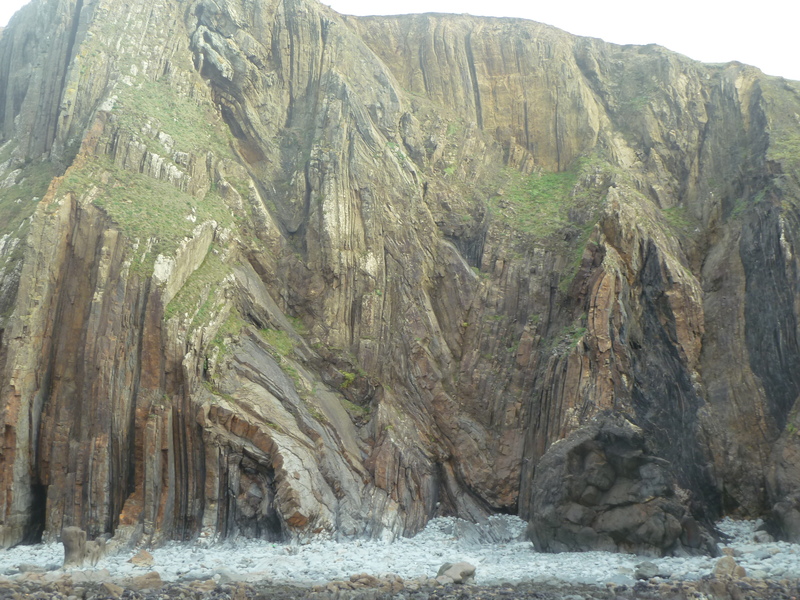 The sea was incredibly loud, as the sound reverberated off the towering cliffs behind me. Sharing the moment with the gulls. 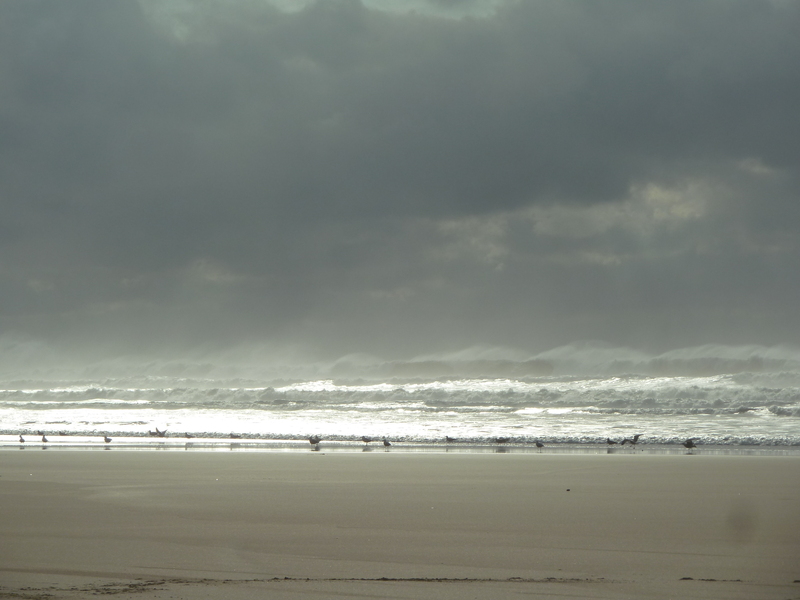 The sun was coming through and the wind whipping the top of the surf. Click on any of the photos to get a bigger better image. The sun of high summer gives clear blue skies and little shadow, but when the sun is lower in the sky and you are more aware of the break of the day and the setting of the sun, it provides endless variations in colour and light in the sky. Those brighter autumn and winter days sparkle as light filters through the hedges and trees with a soft warmth. I walked the breakwater at Bude early one morning last week as the sun was just rising. It rises over the back of the town and the sun shone down over the beach and this early warmth created a lovely distant mist. I am sure you will have noticed that I have not posted for a while. I have also not painted for more than a few weeks. 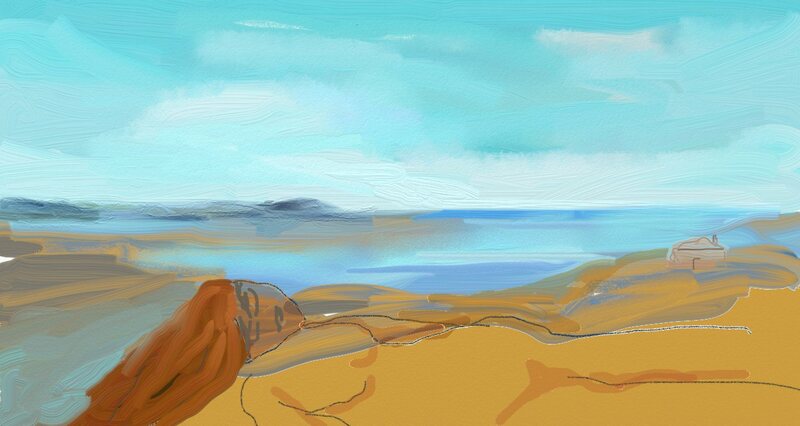 After a fab holiday in Ibiza, I really need to find some inspiration, so thought I would have another dabble with the Artrage programme. Because you are not wasting paint or paper and only wiping a few pixels when you make a mistake, you can really let loose and all sorts of images start to appear. Don’t ask me where the one above came from?… hopefully some deep creativity unbound from the constraints of the costs of raw materials!!. It does have its limitations ie, lack of control, as my finger slips and slides over the touchpad, but maybe that is also the beauty of it – its looseness, imperfect lines and mismatched proportions. Is this a brief fling to get me back into painting or will it become something more?